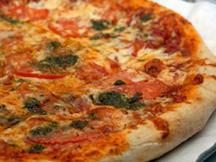 Pizza restaurants San Francisco are a pleasant surprise to most Bay area visitors. East coasters and Midwesterners, particularly, deep dish-loving Chicagoans who now live in San Francisco love to moan about the city's supposed lack of decent pizza, but don't listen to them. San Francisco has more than its fair share of terrific spots to grab a slice or a whole pie. Here's our guide to the cream of the crop of pizza restaurants. Full-service Neapolitan Italian restaurant makes pizza that's a big hit with the Marina district residents it primarily serves. The pies are extremely well priced, as is everything else on the menu. Do be warned that the noise level can rise on the weekends. Arinell serves up slices and pies that come pretty darn close to what you'd get in New York City. This plain, tiny pizza joint is without a doubt one of the easiest and fastest spots to grab a bite to eat if you're on the go. There's barely any seating. A very popular spot to stop in at if you're heading out to drink for the night at one of the many bars near the 16th and Valencia streets intersection. Escape From New York PizzaRevered pizza joint takes its name from the cult sci-fi flick starring Kurt Russell, and the pies really do taste as if they've been tossed and delivered straight from the Big Apple. Definitely try a slice of the pesto and potato pizza if you hit any of the three SF locations. Known for its "sourdough crust and city views," this Potrero Hill restaurant is a must for those who demand only the freshest and most interesting toppings, like jalapeno peppers, for their pizza. The red-and-white checkered tablecloths make you feel as if you've just touched down in Italy. San Francisco's deep-dish pizza void has been filled by this dark, minimalist Western Addition hot spot, an overnight word-of-mouth sensation since opening its doors in early 2005. The pizza is a wee bit pricey, but oh so worth it. Bring some coins for the jukebox, which features classic albums by The Breeders, Modest Mouse, and Yo La Tengo, to name a few. This no-frills pizza joint offers slices that have won over who claim there's no good pizza restuarants San Francisco. The pizza is not too doughy, a common SF pizza problem, and the crust is amazing. If you're hungry and have been out drinking and dancing at one of the many clubs near the Castro location, definitely stop in at Nizario's for a slice before 2 a.m. rolls around. The place gets packed once "Last call!" is announced at nearby bars. Pauline's gourmet-style pizza may be a bit more expensive than the pies you'd get in an ordinary pizza place, but then again, Pauline's is no ordinary pizza place. Exotic pies, delicious salads, terrific desserts and wines make this Mission District sit-down restaurant one of the best places to eat, period! Crayons and tablecloths made out of big sheets of paper will keep the little ones doodling while you wait for you food. This classic North Beach Italian eatery has been open since 1935, and features consistently excellent and raved-about pizza that's made in an oak-burning brick oven. There's a full service Italian menu for those who aren't in the mood for pizza.